Survive the onslaught of waves of enemy ships. Pilot your ship the Utopia in the defence of your home planetary system. 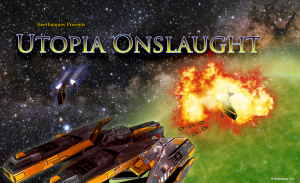 Utopia Onslaught is a traditional vertical scrolling shoot em’ up, with the initial release being a basic timed survival game. Later releases will have an enhanced game play progressing through levels after you meet and destroy the boss ship. There will also be more weapon pickups and a wider variety of enemies to shoot.